After deciding on a model, you often need to use your model to score new or existing observations. The Score node can be used to evaluate, save, and combine scoring code from different models. In this example, you want to score a data set using the Regression (3) model. On the Assess tab, drag a Score node to your diagram workspace. Connect the Regression (3) node to the Score node. First, set the value of the Type of Scored Data property to Data. Right-click the Score node and click Run. In the Confirmation window, click Yes. Click Results in the Run Status window. In the Results window, maximize the Optimized SAS Code window. This is the optimized score code for the Regression (3) model. You can save the optimized score code by selecting File Save As on the main menu. 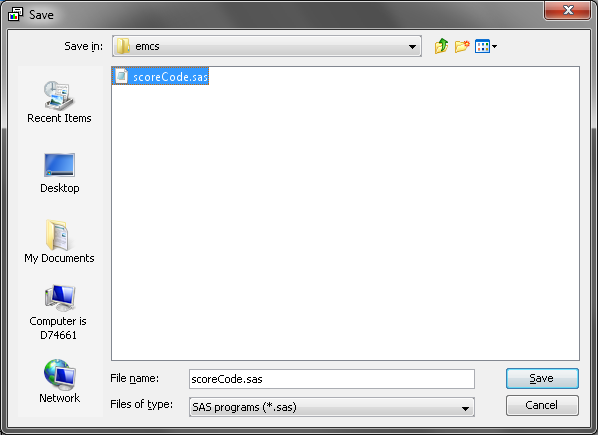 In Save window, navigate to an appropriate location for you to save the score code and enter scoreCode.sas in the File name field. This enables you to make changes to a model without losing the score code for an accurate model. You can use the saved score code to score a data set by using Base SAS. The program requires only Base SAS to run. Therefore, you can run the program on any of the systems in which you have installed Base SAS, regardless of whether SAS Enterprise Miner is installed. SAS Enterprise Miner runs on top of a SAS session, and you can use this SAS session at any time. Use this SAS session to score the DMAHMEQ data set in the SAMPSIO library. This data set contains all the same inputs as the HMEQ data set, but it also contains response information. This enables you to compare the predicted outcome to the actual outcome. From the main menu, select View Program Editor. This opens the Program Editor — Editor window in place of the diagram workspace. From the main menu, select File Open. In the Open window, navigate to the location where you saved your score code. Select your code and click Open. These lines create the myPredicted data set and choose SAMPSIO.DMAHMEQ as the data set that is scored. This code prints the value of BAD as well as P_BAD1 and P_BAD0. P_BAD1 is the predicted probability of default, and P_BAD0 is predicted probability of not defaulting. Note: Although it is not necessary, you should consider sorting the observations by one of the variables, such as P_BAD1. To do so, add the code that follows before the PROC PRINT statement. 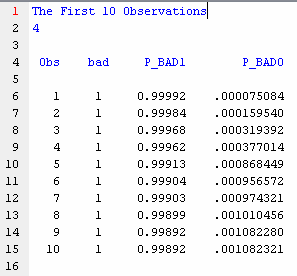 By sorting the observations by descending values of P_BAD1, you arrange the most likely to default observations at the top of the printed results. The example in this book does sort the data. Submit the score code by selecting Actions Run on the main menu. After the code has finished running, click the Output tab at the bottom of the Program Editor window. Notice that the 10 observations with the greatest value of P_BAD1 were printed. Observe that because BAD has two levels, and the value of P_BAD1+P_BAD0 is always 1. Close the Program Editor window to return to your process flow diagram. In the Data Source Wizard, click Next. Enter SAMPSIO.DMAHMEQ in the Table field. Click Next. In the Table Information window, click Next. In the Metadata Advisor Options window, click Basic. Click Next. In the Column Metadata window, click Next. In the Create Sample window, click Next. In the Data Source Attributes window, set the value of Role to Score. Click Next. In the Summary window, click Finish. This creates the All: Home-Equity Loan Scoring Data data source in your Project Panel. Drag this data source to the diagram workspace. Connect the All: Home-Equity Loan Scoring Data data source to the Score node. Set the value of the Type of Scored Data property to View. In the Score Data properties subgroup, set the value of the Validation and Test properties to Yes. Right-click the Score node and click Run. In the Confirmation window, click Yes. Click OK in the Run Status window. You must replace <diagramID> with the value of the ID property. This value is displayed when you select the diagram in the Project Panel. Close the Training Code window. Click Yes in the Save Changes window. Right-click the SAS Code node and click Run. In the Confirmation window, click Yes. Click Results in the Run Status window. The scored values here should match those obtained in the previous section. Close the Results window.